We can’t avoid complexity, but we can push it around. We can bury it out of sight. This is the old “black box” principle at work; a black box performs a complex task, but it possesses simplicity on the outside. This idea of managing complexity is one of the classic commandments of programming, of course, and a core theme of Structure and Interpretation of Computer Programs, but this was a nice restatement. It looks like this edition (in all it’s 800+ page glory) will be quite a treat. I just spent a few minutes enjoying Mongrel and SVG::Graph while helping Rob visualize his Amazon Sales Rank for his book. The code is available here with a running (maybe) example here. 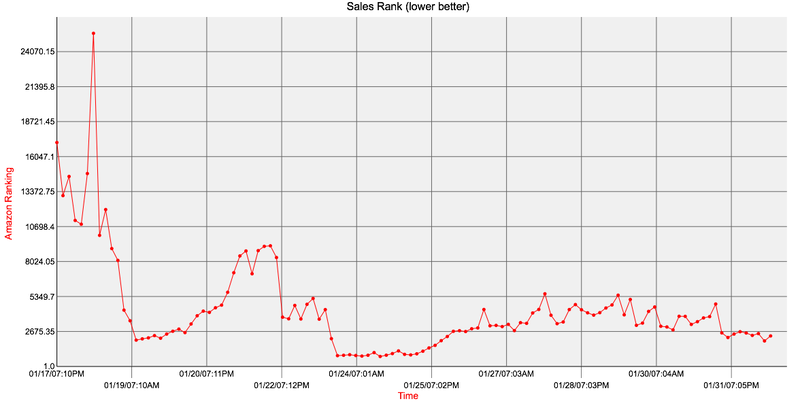 If all goes well, that should show you an SVG graph (thanks, Firefox) showing the changes in sales rank over time. Rob’s code to generate the scrape is here.